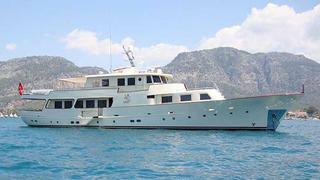 Jan Jaap Minnema at Fraser Yachts in Monaco tells me that he has signed the 33.71m canoe stern motor yacht Samra's for sale. Samra's was built by Clelands in 1960 and in 2005 this superyacht was totally rebuilt to become a classic gentleman’s yacht, with new engines, generator and interior and now offers accommodation for eight guests in a master, VIP and two twin cabins. "She's always been used as a private family boat," says Jan Jaap. "A particular feature is her huge sundeck, rarely found in classics of this type." A pair of 540hp MAN engines give Samra’s a cruising range of 3,500 nautical miles and she's on the market asking €1.75 million.